The study in Renaissance Italy was the ideal place to house collections of both antique and modern works. Contemporary images and descriptions show that studies varied from the well organised to the haphazard, with functional objects like candlesticks, inkstands and bells sitting alongside collectibles such as medals, gems and antique coins. Some were kept on the desk, while others were stored in cupboards, or placed on shelves ready to be lifted down and admired or used. 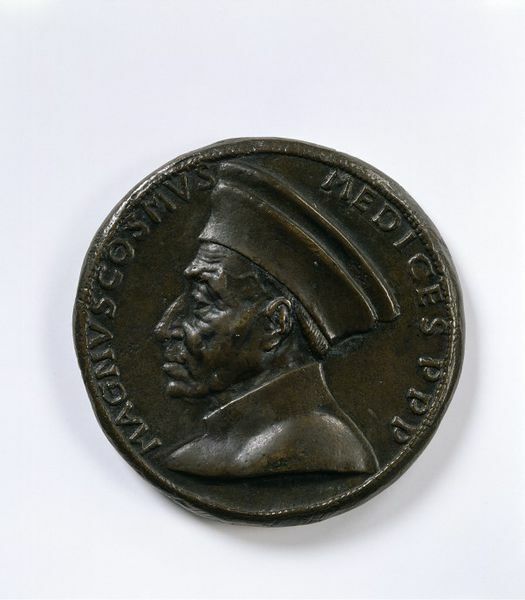 This medal depicts Cosimo de' Medici the first of the Medici political dynasty, de facto rulers of Florence during most of the Italian Renaissance. The Medici were bankers, and their company was one of the most important in Europe. But the head of the family, Cosimo de' Medici (1389-1464), was also the unofficial ruler of the Florentine Republic. Here he is shown with the letters PPP for 'Pater Patriae' (Father of the Fatherland). This title, taken from classical Rome, was given him after his death. 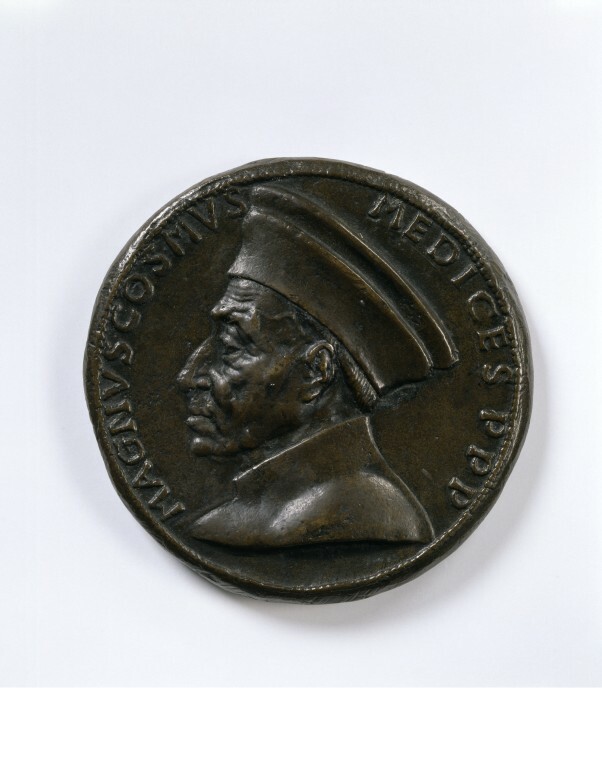 Medal depicts on the obverse the bust to the left of Cosimo de' Medici, wearing a flat cap. Inscription. On the reverse a female figure, for Florence, seated on a throne, the whole placed above a yoke. Inscription. 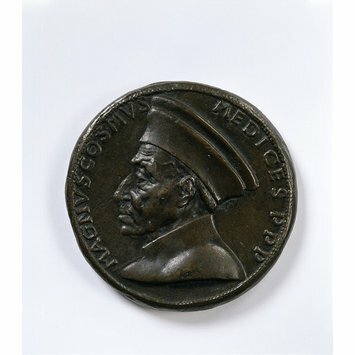 The Medici were bankers, and their company was one of the most in Europe. But the head of the family, Cosimo de' Medici (1389-1464), was also the unofficial ruler of the Florentine Republic. Here he is shown with the letters PPP for 'Pater Patriae' (Father of the Fatherland). This title, taken from classical Rome, was given him after his death.